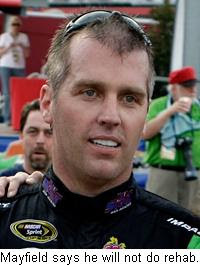 Jeremy Mayfield appeared in North Carolina Superior Court in Charlotte today, and his attorney ended weeks of speculation by testifying that NASCAR informed Mayfield that he had tested positive for amphetamines at Richmond International Raceway last month. Attorney Bill Diehl requested a temporary restraining order on Mayfield's behalf, which would allow him to resume his driving career until the case is settled. Diehl made seven different charges to support the request, including breach of character, saying that NASCAR is unfairly preventing Mayfield from plying his trade as a professional race car driver. Diehl also told a judge that Mayfield had been taking medication for allergies and attention deficit disorder. He also accused Aegis Laboratories -- the company that oversees and runs NASCAR's substance abuse program -- of testing Mayfield's urine samples in a manner that violated federal guidelines. NASCAR's lawyer, Paul Hendrick, argued that the sanctioning body, "cannot allow people to drive when we think that he has issues of drug abuse or a positive test." He also asked that NASCAR be given more time to respond to the complaint, since Mayfield had already forfeited his chance to qualify for this weekend's race at Dover by failing to turn a practice lap. No word yet on when the judge might render a decision. Mayfield Motorsports was a surprise scratch from this weekend’s Autism Speaks 400 at Dover, after saying less than a week ago that they would compete on the Monster Mile with driver JJ Yeley at the wheel. There have been plenty of rivalries in the history of NASCAR Sprint Cup racing. Richard Petty and Bobby Allison had their moments of animosity in the late 1960s and early `70s, and there was a time in the `80s when it would not have been wise to invite Darrell Waltrip and Rusty Wallace to the same cocktail party. NASCAR is a kinder, gentler and (some would say) blander sport these days, however, and aside from Carl Edwards occasionally attempting to strangle Kevin Harvick, it’s tough to find a real, lasting rivalry of any kind in the Sprint Cup garage. 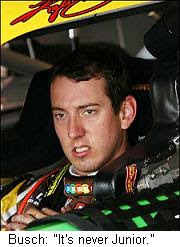 Kyle Busch wants to change all that. Since his departure from Hendrick Motorsports following the 2007 season, Busch has made no secret of his desire to outshine his replacement in the Hendrick camp, Dale Earnhardt, Jr. Busch derives great satisfaction from outrunning Earnhardt’s #88 Chevrolet, and has done so with great regularity in the last two seasons. He also seems to enjoy lobbing verbal firebombs at the Earnhardt camp from time to time, saying recently that fans and media members focus too much attention on a single driver (Earnhardt) who doesn’t seem to win many races. Friday at Dover, Busch tossed another molotov cocktail at NASCAR’s most popular driver, suggesting that Earnhardt -– and not deposed crewchief Tony Eury, Jr. -– is to blame for the #88 team’s lackluster performance. “(Earnhardt) is the one who brought that crewchief in,” said Busch. “He’s the one who pulled so hard to bring Tony Eury Jr. in. It looked like it was working there in the beginning, (but) it hasn’t worked since the summer of last year. Shrubby’s comments are guaranteed to ignite another war of words between the Busch and Earnhardt fan camps, whose disdain for each other boils just below the surface, even on the best day. That may actually be a good thing for a sport that badly needs a legitimate, “we hate those guys” rivalry to add some spice to the soup. There's a reason why Rick Hendrick is widely recognized as one of the top team owners in the history of NASCAR. Hendrick removed Tony Eury, Jr., as crewchief of Dale Earnhardt, Jr.'s National Guard/AMP Energy Drink #88 Chevrolet Thursday, after a dismal, 40th place showing in the Coca-Cola 600 dropped the team to 19th in the championship standings. The decision to make a change was a no-brainer. More difficult was the decision on what to do next. Earnhardt is strong-willed to the point of stubbornness, and has displayed fierce loyalty to his now departed cousin/crewchief. The last time he was teamed with a crewchief not of his own choosing -- DEI's Pete Rondeau -- the partnership lasted only a few weeks before Rondeau walked away, reportedly unhappy with Earnhardt's communication skills and unwillingness to consider ideas that were not his own. In an attempt to avoid a repeat performance, Hendrick has replaced Eury with a sort of crewchief-by-committee. Beginning next week, interim crewchief Lance McGrew, team manager Brian Whitesell, lead chassis engineer Rex Stump and engineer Tom Stewart will all play major roles in determining Earnhardt's chassis setups and race strategy. McGrew will fill the crewchief's role at least for now, with assistance from Whitesell. Stump will provide input on the nuts-and-bolts, while Stewart assists with race strategy. It's an ingenious approach, for two reasons. First, it insulates McGrew from the scrutiny associated with serving as crewchief for NASCAR's Most Popular Driver. More important, it provides a "strength in numbers" approach to dealing with Earnhardt himself. In the past, Eury's decisions have been subject to frequent second-guessing from the cockpit. With McGrew, Whitesell, Stump and Stewart all contributing their expertise, Earnhardt may have no choice but to do things their way. Hendrick explained the move in a prepared statement, saying, "Our performance hasn't been where it should be. It's impossible to pin that on any one factor, but a change is the right decision at this point. We have a plan in place, and we're going to move forward with it. "We're going to put our full resources toward improving the situation and winning races," said Hendrick. "It's going to be a collective effort that includes all of our drivers, all of our crew chiefs and all of our engineers. Everyone in our company will be involved on some level." 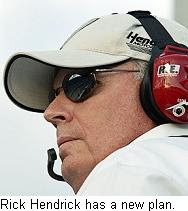 Hendrick has said repeatedly that he would not make a change simply for the sake of change. In that regard, he has proven to be as good as his word. Today's announcement lays the groundwork for a newer, stronger, less disfunctional #88 team; a team capable of fulfilling Earnhardt's promise as a driver and giving Hendrick Motorsports a fourth championship contender. After a dizzying day of conflicting reports about the status of Tony George as CEO of Indianapolis Motor Speedway, George has confirmed that he will remain at the helm of the family businesses. 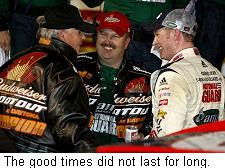 SPEEDtv.com reported early Wednesday that George had been voted out during a meeting the previous evening in Indianapolis. 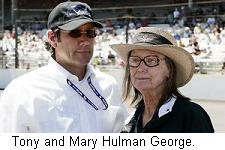 The report said that a vote by the speedway’s Board of Directors – which includes George’s mother Mari Hulman-George and sisters Josie, Nancy and Kathy – reportedly turned the longtime CEO out, after expressing displeasure with the amount of money George has spent to bankroll the IndyCar Series and upgrade the speedway. SPEEDTV.com said that Indianapolis Motor Speedway Chief Financial Officer, Jeff Belskus, and General Counsel Curt Brighton would likely oversee operations until a permanent replacement was named. Tony George said, “Contrary to published reports, I continue to serve as CEO of IMS. Our board of directors met yesterday, and we did discuss how to best confront challenges and exploit opportunities facing our businesses. This is nothing new and is something that we continually do as a board. But no changes in leadership or responsibility have been made. Okay, let's just assume that Danica Patrick is coming to NASCAR. There are plenty of reasons to doubt Patrick's interest in driving stock cars, but for the sake of discussion, let us assume that her new agents -- the high-powered IMG Sports Marketing Agency -- have finally convinced her that NASCAR is indeed the land of milk and honey. If Patrick does elect to jump the fence, she will instantly rival Dale Earnhardt, Jr., as NASCAR's most visible (and talked about) star, in addition to tripling her already lofty annual income in one fell swoop. But where would she land? Which NASCAR team would be willing -- and able -- to field cars for Patrick and guide her through what certainly would be a difficult transition from open wheels to full fenders? Patrick drove a Daytona Prototype owned by Richard Childress Racing in this year's Rolex 24 at Daytona. However, RCR is currently at the four-team limited mandated by NASCAR, and would have to release either Kevin Harvick, Jeff Burton, Clint Bowyer or Casey Mears to make room for Patrick. Back in 2006, Roush-Fenway Racing owner Jack Roush tendered an open invitation for Patrick to drive for him, anytime she wanted. If that offer still stands -- and there is no reason to believe it does not – Roush would have to create room in an already overcrowded shop for Danica. Roush-Fenway already fields five Sprint Cup teams for drivers Carl Edwards, Matt Kenseth, Greg Biffle, David Ragan and Jamie McMurray. One of those drivers will move across the parking lot to Yates Racing next season to satisfy NASCAR’s four-team cap, and adding Patrick to the mix will crowd the equation even further. Hendrick Motorsports shares a sponsor -- GoDaddy.com -– with Patrick, and pre-sponsored drivers are a luxury in NASCAR these days. Like Childress, however, Rick Hendrick is already at the four-team limit, and would have to jettison Jimmie Johnson, Jeff Gordon, Mark Martin or Dale Earnhardt, Jr. to make room for Danica. While Martin is expected to cut back to a part-time schedule in 2011, Brad Keselowski is waiting in the wings to replace him. Stewart-Haas Racing – a Hendrick satellite team -- could provide a home for Patrick, without forcing Rick Hendrick to fire anyone. However, the most likely spot for Patrick to land is Joe Gibbs Racing. 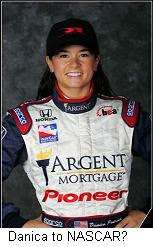 JGR is also represented by IMG Sports Marketing, and Danica tested a Nationwide Series car for the team in 2002. Most importantly, JGR has plenty of room for a fourth Sprint Cup Toyota under NASCAR's four-team cap, and coach Joe Gibbs has long said that he would like to add that fourth car, if the circumstances were right. A driver of Patrick's caliber -- complete with sponsorship -- is simply too good for JGR to pass up. Is Danica serious about NASCAR this time around? It's impossible to say. But if she does opt for a change of racing venue in 2010, she will have no shortage of suitors. Sometimes Racing Is Hard Work! 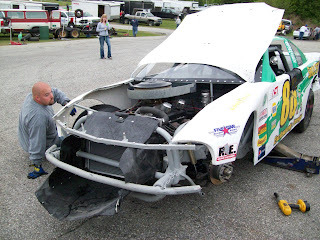 Sean McCarthy's Sirius Speedway/Lenny's Shoe and Apparel/MK Richardson Insurance Chevrolet took a hard ride into the concrete during qualifying for Sunday's Memorial Day Classic at Vermont's Thunder Road International Speedbowl. Click HERE for a video link to the crash footage. In addition to a bit of body damage, the front frame was pushed more than eight inches to the left. 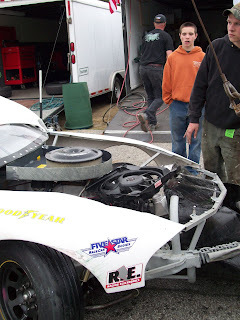 After a long night of work, the car ran in Sunday's main event, only to be knocked out in yet another crash. Isn't racing fun?? Jeremy Mayfield's new attorney, Bill Diehl, spoke publically for the first time Wednesday, speaking exclusively with Sirius Speedway about his client, a possible lawsuit against NASCAR and the impact of the controversy on Mayfield's career. Dave Moody – Has there been, or will there be a lawsuit filed in this matter? Bill Diehl – First question, no lawsuit has been filed. Will there be a lawsuit? That will depend on what happens between Jeremy and NASCAR, which ought to be known in the next couple of days. DM – What kind of conversations are being had between Jeremy, yourself, NASCAR and their representatives to try and settle this? BD – They’re obviously focused on whether or not Jeremy was suspended properly. Is what happened to him legitimate, should he stay suspended, should he have to go through some type of rehabilitation that they’ve asked for? Has he been mistreated and have they improperly deprived him of a way to make a living. There are (also) some side issues. They’ve said a lot of things about him that Jeremy doesn’t believe are true. There’s a separate remedy for that kind of behavior. DM – Specifically, what has been said? DB – I read a report where Mr. France gratuitously announced that the serious recreational drug use by Mr. Mayfield was very difficult, very bad. Accusing somebody that’s driving a racecar a couple hundred miles an hour of serious recreational drug use, that’s probably not a very good thing to say about him. Especially if it’s not true. 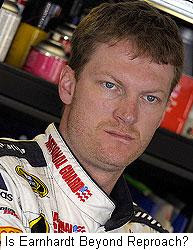 DM – Can you tell us, what specific substance has NASCAR accused Jeremy of having in his system? BD – We have two reports that they furnished me (with) yesterday and then they just sent me one a couple hours ago that they hadn’t furnished. I’m not going to talk about them yet. If we get in a situation where we’ve got to talk about them, we’ll talk about them. DM – Do the two reports come to the same conclusion? Do they name the same substance? BD – I’m not going to tell you what the reports say. I’ve read lots of stuff that indicates what the NASCAR reps have said and what this guy (Dr.) Black has said. The game about what is in the report is just that at this point. It’s a game. But I’m not going to participate in that game currently, beyond saying that they finally furnished two reports which they probably should have given to Mr. Mayfield long before this week. DM – Jeremy has said from the start that this all boils down to a prescription medication that was prescribed by a doctor for his allergies, combined with a couple of Claritin D tablets that he took on the day in question at Richmond. Can you tell me what the prescription medicine that he took was? BD – No, I won’t reveal that yet. But again, that’s something that he’s told NASCAR. They know what it was, and they’ve gotten the information from the doctor. They’re dealing with everything Jeremy could have furnished them (with) about anything that he’d taken, according to Jeremy. He did take a prescription drug, he does have a medical doctor who prescribed it, and they have that data and they had the information about the Claritin D.
DM – What would it take at this point to avoid taking this to court? BD – Some type of acknowledgement that what happened was a mistake on the part of somebody, in connection with what they did and how they did it. We’re exploring that with them. We can’t put Humpty Dumpty back together again. They’ve said it, they’ve suspended him, and we know there are a couple of reports because we now see them. Somebody is going to have to come forward and acknowledge that, well, we thought we did what we were supposed to do, (but) maybe we made a mistake, let’s try it again. DM – What’s Jeremy’s frame of mind and attitude right now? BD – I think he’s very upset and he’s insulted. He’s had a 17-year career, had some successes. He’s just getting started with his own team, and this sort of takes you out at the knees if you’re suddenly accused of being a recreational drug user and you’re suspended from doing what you get paid to do. He wants everybody to know that he’s not guilty of what he’s accused of. DM – Is there any unofficial timeline at this point for you to decide whether or not this takes the next step into the legal system? BD – Yes, there is. But I’m not going to tell you what it is. The man in charge of NASCAR's substance abuse program says he personally told Jeremy Mayfield what substance had been found in the driver’s system. Dr. David Black is the CEO of Aegis Sciences Corporation, and he said yesterday that he identified the specific drug found in Mayfield’s test sample in several conversations with Mayfield over a three-day period last week. Mayfield claimed Saturday that he has yet to be informed what drug caused the positive test, and repeated his earlier belief that a combination of a prescription drug and Claritin-D led to his suspension from NASCAR. Black has repeatedly rejected that explanation, saying the drugs Mayfield cited could not have produced the results in question. Black's latest salvo notwithstanding, there is little doubt that Mayfield is winning the public relations battle with NASCAR. His appearance at Saturday’s Sprint All-Star Race was carefully choreographed, right down to the videographer and audio engineer he brought along to document the outing. It’s no coincidence that Mayfield climbed atop a hospitality trailer emblazoned with the logos of NASCAR’s most popular driver – Dale Earnhardt, Jr. – to wait for the media onslaught he certainly knew would ensue. And when it did, he was more than happy to climb down and tell his tale … yet again. Mayfield knew he wasn’t supposed to be at Lowe’s Motor Speedway Saturday night. Too many drivers, crewchiefs and crewmembers have been barred from various speedways in recent years while serving suspensions for there to be any misunderstanding about that. But the opportunity to make his case yet again, smack in the middle of NASCAR’s All-Star celebration, was too good to pass up. Being unceremoniously escorted off the property by track security didn’t hurt his image as the embattled working man, either. Faced with a “he-said/she-said” situation like this, people tend to believe individuals over corporations. We want to believe that no NASCAR driver would ever abuse drugs, even though Shane Hmiel, Aaron Fike and the late Kevin Grubb have provided tragic proof to the contrary. NASCAR could end this whole, ugly debate instantly by publicizing what specific substance was found in Mayfield’s system, allowing medical experts to determine – once and for all – whether Mayfield is the unwitting victim of a tragic mix-up, or a simple drug addict. NASCAR refuses to do so, however, clinging stubbornly to the belief that they have no right to divulge information that Mayfield himself seems unwilling to divulge. 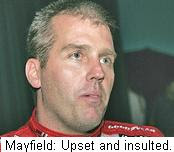 I consider Jeremy Mayfield a friend. We reached out to him last fall to provide expert analysis on NASCAR’s 2008 Chase For The Sprint Cup, and he did an outstanding job. I have never seen or heard anything from Jeremy that made me suspect drug abuse. However, I also have no reason to believe that NASCAR would randomly destroy a driver’s career by leveling an unfounded accusation, as Mayfield accuses them of doing. I am personally torn by the whole debate, as are many in the NASCAR garage. The one thing I do know, however, is that I’m tired of hearing people call each other liars. At this point, NASCAR has said all it needs to say. They have stated repeatedly that the substance in question was not alcohol, an OTC medication or a legally prescribed drug. They say they have informed Mayfield – on three different occasions – what the substance is, and why he was suspended. Continuing to play “he-said/she-said” with Mayfield is pointless, and does nothing to clarify an admittedly murky situation. 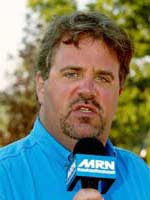 In my view, it’s time for NASCAR to turn the page on Jeremy Mayfield and make the next move his. Leave him to either attend rehab as required by the sanctioning body – something he has defiantly insisted he will not do – or file a lawsuit against NASCAR, making the results of his drug test a matter of public record, once and for all. It’s time for this daily dog and pony show to end, and for Mayfield to take action, one way or another. And better yet, it’s time to get back to racing. Despite being suspended indefinitely by NASCAR for violating the sanctioning body’s substance abuse policy, Jeremy Mayfield showed up at Saturday night’s NASCAR Sprint Cup All-Star Race. Mayfield told reporters, “I'm alive, well and healthy, (and) here to watch my car run,” and complained that he has not yet been told by NASCAR what specific substance led to his suspension. “They've indicated something different every day of the week,” he said, repeating earlier claims that a mixture of an unnamed prescription drug and two Claritin D pills caused his positive test result. He said Mayfield has been verbally informed of the substance in question by NASCAR's medical review officer on three different occasions in the past week. Poston also said Mayfield misunderstood the terms of his suspension, which should have banned him from the property at Lowes Motor Speedway. He said NASCAR officials have now spoken with Mayfield, and that he has agreed to comply. Mayfield was defiant when asked about plans to complete a NASCAR-mandated rehabilitiation program as part of his effort to be reinstated. "I'm not going to rehabilitation," he vowed. "Why would I? Would you go to rehab if you didn't have a problem?" NASCAR CEO Brian France shed light on Mayfield's case late last week, calling it “a serious violation” of the sanctioning body's substance abuse policy. He added that he considers performance-enhancing and recreational drugs to be serious violations. France also attempted to reassure drivers that over-the-counter medication and the use of legitimately prescribed prescriptions will not lead to NASCAR sanctions. He said a number of drivers have already tested positive for those substances this season, and been cleared of any wrongdoing after conversations between NASCAR and their doctors.